Hopefully you didn't stay out tooooo late last night, and hopefully you aren't "feelin' it" today. Last night, Taylor and I went over to our friend's house and hung out with her and her husband and a couple other friends. Being that we are old people (especially me), we headed home before the New Year came into existence. I know everyone and their brother is going to be posting a resolutions post today, but that's ok. Hopefully something I say will inspire you differently than the way someone else inspires you. We can all help each other in different ways. First of all, let me say that resolutions are really just goals. It's good to have goals. 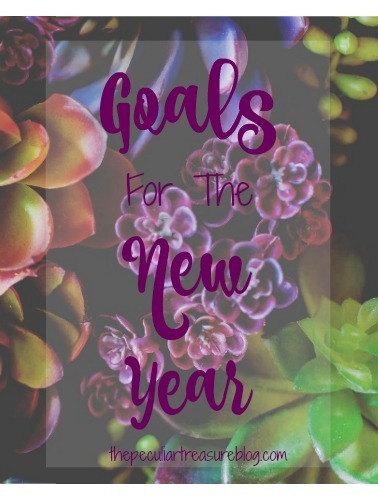 But if you only create goals because it's a New Year and you "just should", then there's no point. Within a month you'll have given up. Only create goals that you really are passionate about accomplishing. So first off, here are the personal goals I am passionate about accomplishing this year. Tithe- I really believe in the importance of obeying God by tithing, but Taylor and I have barely tithed since we've gotten married. Our funds are so slim that we don't tithe, but I truly believe that we should trust God to provide for us. He will honor the fact that we are giving our "first fruits" to Him. My relationship with God- Ever since I went to college (gosh, that was 6 years ago!) my time spent with God has been ridiculously minimal. I still live for him. I still pray daily. But my prayers tend to be very Kristin-focused, and my Bible reading is sparse (and that's being generous). Part of this is because of my anxiety and some spiritual and mental battles I face. Some of this is selfishness with my time. And some of this is just down-right laziness. I mean, I can binge-watch and entire series on Netflix before I decide to read my Bible...wow, Kristin...just wow. Weight/Health- I've gained 110 pounds since my Freshman year of college. I hate the way I look and I hate the way I feel. I've tried and tried to lose weight, but I always give up. I love french fries and I hate discipline. But I want to be healthy. I want to glorify God through taking care of my body. And I want to feel pretty again. I want to feel like I look nice for my husband, instead of feeling like a blob. He doesn't feel that way about me, but I feel that way about myself. I don't want to just tell you guys what I want or wish for. I want to have a plan and goal. So here is my plan and my goals for my personal resolutions. By the end of January, I want to have lost five pounds. I plan to do this by cooking at home, cooking with less grease and fat and adding in more vegetable, and by exercising (walking or doing Just Dance on Wii) at least three times/week. As far as tithing goes, by the end of January, I want us to have decided on our church (we have it narrowed down to two) and pull out 10% off the top of every paycheck we receive. I desire to continue this through the year. 2 times per week and physically reading my Bible 1 time per week. By the end of February, I want to have lost another 3 pounds (8 total). I plan to increase my exercise to 4 times/week. 3 times per week and physically reading my Bible 1 time per week. By the end of March, I want to have lost another 5 pounds (13 total). I plan to keep my exercise at 4 times/week. 3 times per week and physically reading my Bible 2 time per week. By the end of April, I want to have lost another 5 pounds (18 total). I plan to keep my exercise at 4 times/week, but start looking for different types of workouts I can do through the hot, Charlotte Summer. By the end of May, I want to have lost another 8 pounds (26 total). I plan to keep my exercise at 4 times/week, and start swapping in those summer workouts. 2 times per week and physically reading my Bible 3 time per week. By the end of June, I want to have lost another 8 pounds (34 total). I plan to reduce my workouts to 3/week, because of the heat. However, I want to make sure that those workouts are slightly longer/more intense. Lose another 16 pounds (50 total) while staying at 3 workouts/week. Stay with listening to Audio Bible 2 times per week and physically reading my Bible 3 time per week. Lose another 15 pounds (65 total). Increase my workouts back to 4 times/week and do as many of them outside as possible. Stick with same Bible routine, adding in more when possible. Lose 5 more pounds, but allow myself to enjoy holiday treats (in moderation). Continue to exercise 4 times/week. Now for my blog and business goals. Blog- I want to grow my readership and monetize my blog. Add Items to Etsy- I want to add jewelry, wax melts, headbands, and more candle scents to my Etsy shop. Buy a camera- I want to put away $10 every month towards a camera (which may mean it takes me well over a year to save up, but that's ok). These goals are going to take a lot of hard work, perseverance, and dedication, but I believe that I can do it. What about you? Do you have lofty goals? Good for you. Go after them! I like that you were so specific with your goals and broke them down month by month. And I understand what you mean about tithing. My husband and I got married in July and it took a while for all of our finances to shake out after the wedding, but you are right in that God will definitely honor your decision to tithe! I think these are such honest goals and ones I think you’ll stick to since they’re so important to you. It’s so vital that we feel good about ourselves in 2016 and I fully support you and your willingness to see where you need to change or alter your current situation! It’s never easy, but I think you’re off to do some pretty great things :) So happy to have found your blog through the Peony Project! Thank you, Kelly! I appreciate that! I hope that you are able to accomplish your goals as well! I love reading goals, but most of all I love your sincerity when establishing them. You know, never it's too late to return to God in prayer and studying His Word. Keep going! Blessings on this new year and journey! I absolutely love how specific and smart you are with your goals. But even more? I love how honest you are. Wow - you're just so stinkin' authentic, and I have zero doubts that you'll reach every single one of your goals. Get healthy for God and for YOU, but He loves you no matter what. He will provide everything you need to reach your goals! You can do it, Kristin! :) I'm with you on the tithing. It's when money isn't there. But God will bless where there is sacrifice. I love setting goals! I've found that writing them down and going back to them often really helps me accomplish what I've set out to do. Good luck on accomplishing yours this year! Great job with this, Kristin. You did what most people fail to do when setting goals, and that is make a PLAN to get there. You've set your sights on mini-goals along the way. Be sure to reward yourself and CELEBRATE when you reach each one! We'll be cheering FOR and WITH you!! I love how you broke down your goals by month; that seems more manageable and overwhelming than just having one list of things you want to accomplish. How will you decide how much to give for a tithe? I can relate to you in your me-centered praying and desire to reconnect with God. Because of it, my husband and I read the Bible together every night, though I have to admit it has given me more questions than answers, but I think that's a good thing. It shows care and involvement, right? Looking forward to hearing progress towards your goals. I once lost 35 pounds, and for me, the first 25 was done purely by changing eating habits and no working out. I read and actually measured serving sizes - you'll be shocked at what an actual portion is once you start doing this! That's something that helped me. Great goals, Kristin! I have complete faith that you can lose the weight and grow your blog. I think that it was really important to map everything out month by month, which I'm so glad you did! This will help track your success better. Cheers to 2016! I love how you've planned out your goals in detail. I think I'm going to begin planning mine out like this as well!